The demonic forces of Trigon infiltrate the minds and bodies of the Justice League, turning the veteran super heroes against their youthful counterparts in the all-new DC Universe Original Movie, Justice League vs. Teen Titans. Produced by Warner Bros. 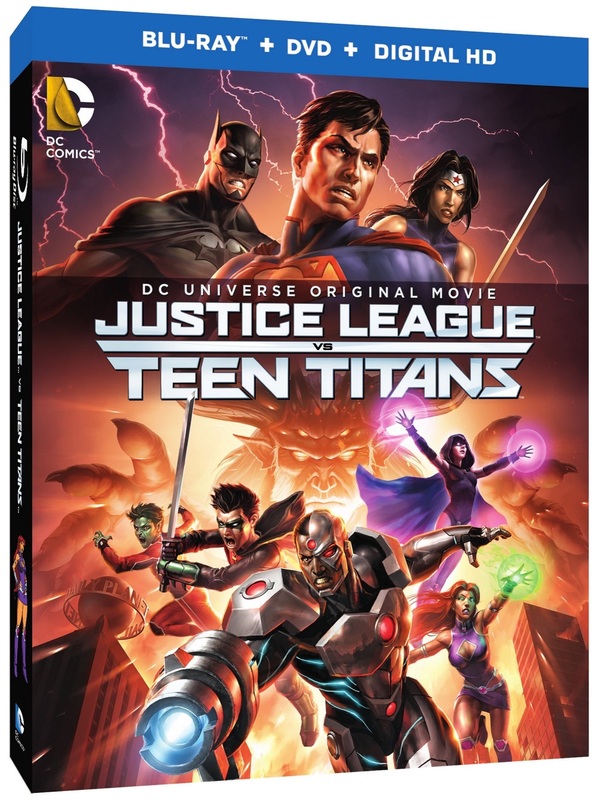 Animation and DC Entertainment, the film will be available from Warner Bros. Home Entertainment on April 12, 2016 on Blu-RayTM Deluxe Edition, Blu-RayTM Combo Pack and DVD. Order due date is March 8, 2016. Justice League vs. Teen Titans will be available on Blu-rayTM Deluxe Edition for $29.96 SRP, Blu-rayTM Combo Pack for $24.98 SRP, and DVD for $19.98 SRP. The Blu-rayTM Combo Pack includes a digital version of the movie on Digital HD with UltraViolet. 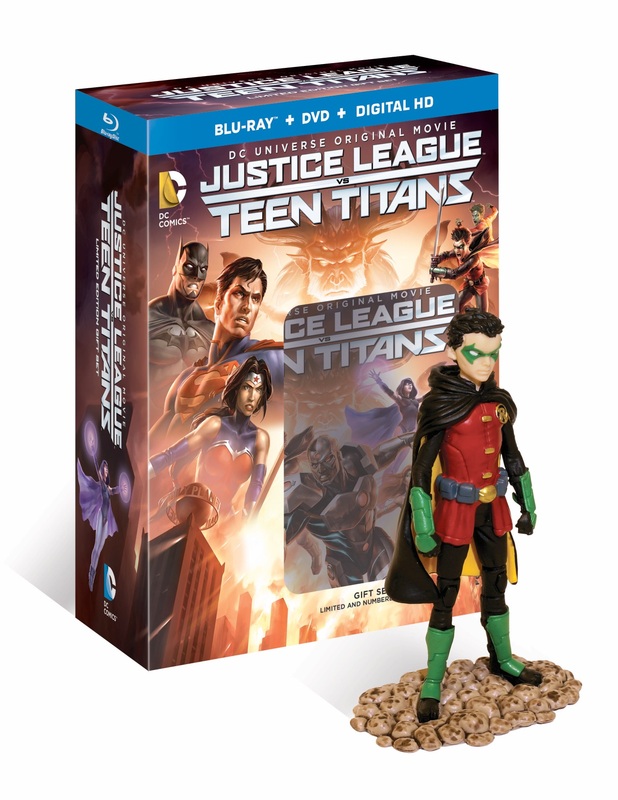 The Blu-rayTM Deluxe Edition will include all components of the Blu-RayTM Combo Pack, along with an exclusive Robin figurine in a numbered, limited edition gift set. Fans can also own Justice League vs. Teen Titans in Digital HD on March 29, 2016 via purchase from digital retailers. Justice League vs. Teen Titans welcomes the Teen Titans to the ever-expanding canon of classic DC Comics characters within the DC Universe Original Movies. When Damian's over-aggressive tendencies almost destroy a Justice League mission, he is sent to learn teamwork by training alongside the Teen Titans. However, adjusting Damian's attitude turns out to be the least of the Teen Titans' troubles as Raven's satanic, world-conquering father Trigon begins an escape from his inter-dimensional prison. To complete his return, Trigon must have Raven's assistance - and to accomplish his goal, he spreads his demonic forces across the globe, infiltrating the minds and bodies of the Justice League to do his bidding. To save the universe and prevent a literal hell on Earth, the Teen Titans must rescue - or defeat - the Justice League, and intern Trigon for all eternity. The voice cast for Justice League vs. 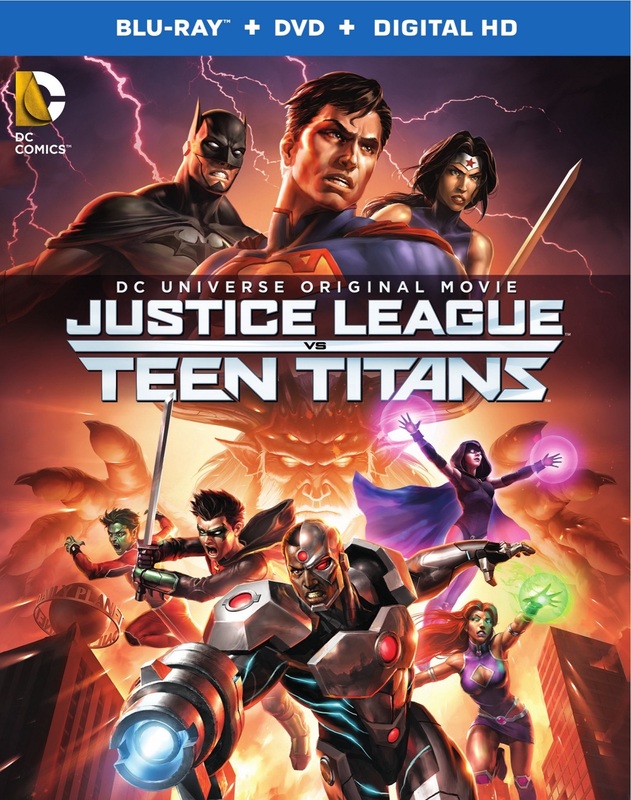 Teen Titans includes several actors reprising their recent Justice League roles - Jason O'Mara (Complications, Terra Nova) as Batman, Jerry O'Connell (Crossing Jordan, Stand By Me) as Superman, Rosario Dawson (Sin City, Rent) as Wonder Woman, Shemar Moore (Criminal Minds) as Cyborg and Christopher Gorham (Covert Affairs, Ugly Betty) as Flash. Sean Maher (Firefly/Serenity, Batman: Bad Blood) also returns as Nightwing, as does Stuart Allan (Batman vs. Robin) as Robin/Damian. Making their Teen Titans voiceover debuts are Taissa Farmiga (American Horror Story, Wicked City) as Raven, Jake T. Austin (Wizards of Waverly Place, The Fosters) as Blue Beetle, Brandon Soo Hoo (Tropic Thunder, From Dusk Til Dawn: The Series) as Beast Boy and Kari Wahlgren (Phineas and Ferb, Legion of Superheroes) as Starfire. Jon Bernthal (The Walking Dead, Daredevil) takes the villainous center stage as Trigon. "Warner Bros. Home Entertainment is thrilled to bring the Teen Titans into the fold of amazing characters within the DC Universe Original Movies," said Mary Ellen Thomas, WBHE Vice President, TV Family, Animation Marketing. "This all-new film provides the Teen Titans with the perfect stage - alongside and against the Justice League - for a thrilling adventure that fans will truly enjoy." Featurette - "Growing Up Titan" - The Teen Titans have fascinated readers for over 50 years due in part to their stories of valor, as well as earning empathy with comic book readers during their own trials growing up into adulthood. This documentary spotlights the importance of young voices in the DC Comics mythology, giving generations of readers a team of heroes that mirror their own life experiences. Featurette - "Heroes and Villains - Raven" - She is the daughter of one of DC Comics' greatest villains, the demon Trigon. Raven is a powerful telepath who uses her soul-self as a means for astral projection. She is integral to the Teen Titans. This documentary is her story. Featurette - "Heroes and Villains - Trigon" - The most fearsome and evil opponent the Teen Titans have encountered is this inter-dimensional demon. Trigon uses his immortality to shape worlds and exact his control. This documentary introduces the character and how he raises the stakes for the Teen Titans. Order "Justice League vs. Teen Titans" on Blu-ray Combo Pack and DVD from our Online Store.